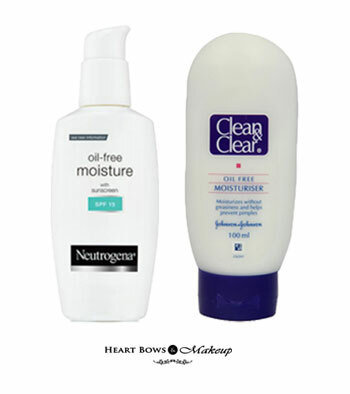 Home » Acne Prone Skin » Best Moisturizer For Acne Prone & Sensitive Skin in India: Our Top 10! 10 Best Moisturizers For Acne-Prone & Sensitive Skin India: Drugstore & Affordable Options! It is a common myth that women with acne prone and oily skin do not require moisturization. We tend to think that the skin already produces so much oil, hence what is the point of loading up another product? But, this is definitely not the case! Every skin type needs hydration in order to stay glowing and healthy. However, it is important to go for an oil-free moisturizer that nourishes the skin without leaving behind any oiliness. So, today we take you through some best moisturizers suitable for acne-prone and sensitive skin in India which includes both affordable and high end options. 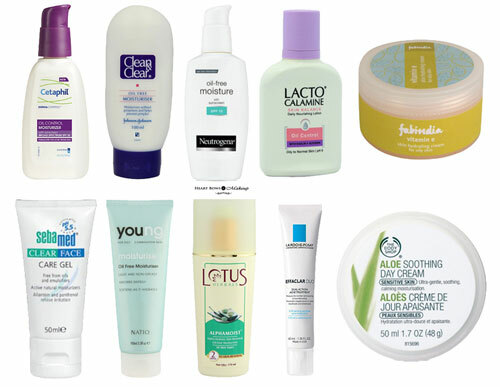 10 Best Moisturizer for Acne Prone & Sensitive Skin: Drugstore & Affordable Options! This non comedogenic and alcohol-free product is an amazing moisturizer for acne-prone & sensitive skin. The formula is lightweight and non- greasy. It also comes with built-in SPF 15 for sun protection. The moisturizer gets absorbed into the skin smoothly and does not clog the pores. 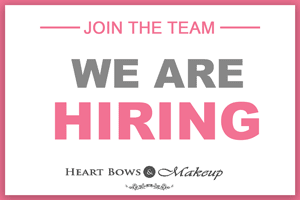 It is allergy tested and free from parabens as well. And, since a little amount is required for each use, the product would last a long time. It does not irritate sensitive skin and is one of the well priced face moisturizers in India. This is probably the most budget friendly moisturizer for acne prone skin in the Indian market today! It contains Salicylic acid, which is good for acne-prone skin. It moisturizes the skin well & feels lightweight. The face moisturizer effectively prevents skin breakouts without being harsh on the skin. All in all, this is a highly recommended product for those with acne-prone and sensitive skin. It was also featured in our best budget beauty products list. This is another wonderful product meant for oily to normal skin. 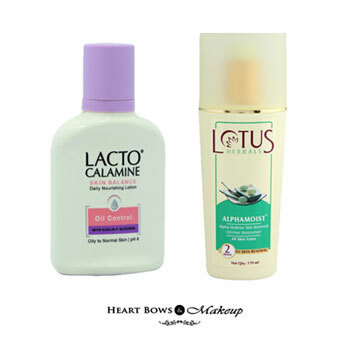 It contains kaolin which contains natural minerals & glycerin that effectively moisturizes the skin. The product gets absorbed into the skin easily and gives a near-matte finish. It moisturizes the skin well and controls oil too. Moreover, it soothes sun burn, rashes and allergies. One of the most affordable face moisturizers in India perfect for summers. As the name suggests, this is an oil-free moisturizer by Lotus Herbals. It instantly gets absorbed into the skin and keeps it well hydrated. 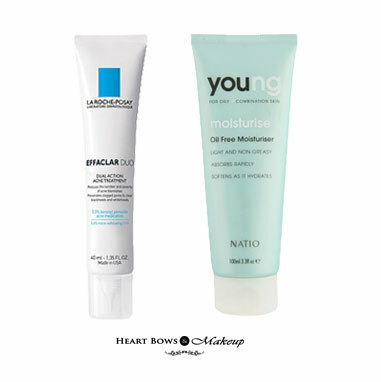 The face moisturizer makes the skin soft and smooth without leaving behind any greasy feeling. It effectively controls oil and does not lead to breakouts making it a great drugstore option for sensitive skin and pimples. It’s also easily available in the market and online on websites. La Roche-Posay is a renowned brand when it comes to skincar.e. This is an excellent moisturizer for acne-prone skin and delivers what it claims. It reduces pimples & acne leading to a clearer skin. Being lightweight, it gets absorbed quickly. Along with this, the moisturizer does not clog the pores and is free from parabens as well. If price is not an issue then is the best moisturizer for acne prone and sensitive skin out there. This is a great moisturizer which suitable for those with acne prone and slightly dry skin. The texture is creamy and does the job of moisturizing the skin well effectively. Only a tiny amount is needed for each use and it keeps the skin soft and supple. It contains ingredients like Rosehip, Mandarin and Green tea which are very beneficial for controlling breakouts. A great oil free moisturizer for acne prone skin which is free of parabens. This is yet another wonderful product from The Body Shop and is ideal for sensitive skin. It is enriched with the goodness of aloe vera and as we recently told you about the amazing benefits of aloe vera for skin, it’s a great ingredient. It also contains glycerin which moisturizes the skin well. The day cream gets absorbed into the skin quickly and does not leave an oily layer behind. It provides a soothing effect to the skin and is free from alcohol as well. Along with this, it feels light on the skin and does not cause any irritation. One of the best moisturizer for sensitive skin in India. 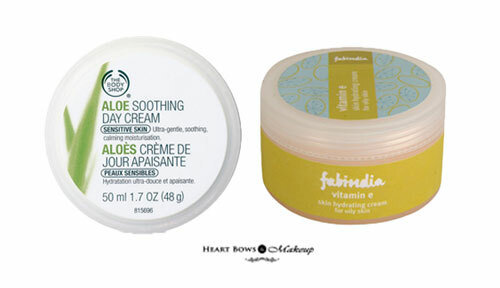 The Fabindia Vitamin E Cream is best suited for those with acne prone skin. Being lightweight & non-greasy, it gets absorbed almost instantly on applying. The skin feels soft & smooth and does not breakout. It contains ingredients like jojoba oil, aloe vera extracts and Vitamin E which keep the skin hydrated without clogging the pores. A great affordable cream for pimples in India. As the names suggests, this comes in a transparent gel form and is very lightweight. It has a pH value of 5.5, which biologically protects the skin against the growth of acne-causing bacteria. It also contains Hyaluronic acid which provides great moisturization. In addition, the product is oil-free formula devoid of parabens. 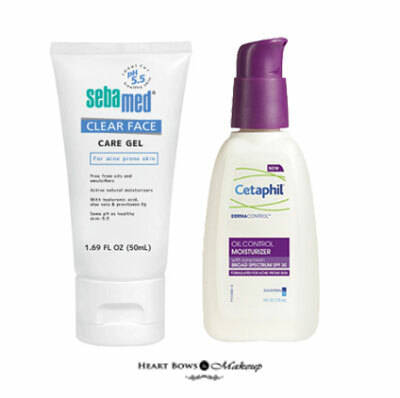 Sebamed makes some of the best products for sensitive skin and we highly recommend this product. This amazing moisturizer is specifically meant for those with acne-prone skin. It has a creamy formula and spreads easily on the skin. It controls shine and feels light. In addition, it also offers sun protection of SPF 30. If your skin tends to breakout no matter what you apply then this is the perfect product for you. Yes, the price is quite steep but it’s an absolute boon for sensitive- acne prone skin. So my lovelies, these are some of the best moisturizers for acne-prone and sensitive skin in India. Taking care of sensitive skin can be a bit cumbersome. However, with the right diet and good skincare products, breakouts can be easily treated. One must make it a habit to drink atleast 3 lts of water for a healthy and clear skin besides using suitable skincare products. 10 Benefits of Coconut Oil For Skin, Hair, Weight Loss & More!